For some making aesthetically-pleasing, narratively-intriguing animation would be enough – but not for the Moth Collective – they seem intent on also saving the planet. Whilst not running around in capes with their pants on show (although I’ve never actually met them in person) or possessing powers passed on by radioactive spiders, this talented group of filmmakers are creating some striking animations covering important and topical themes. 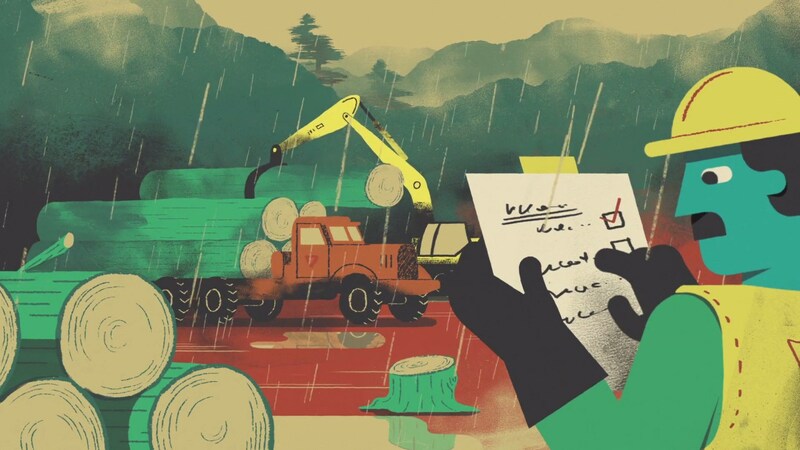 Their second animated short for the Global Canopy Programme once again manages to impress with not only its colourful, immersive animation style, but also with its inventive and impactful approach to conveying some significant messages. Once again allowing DN to get “under-the-hood” of their latest creation, we spoke to the Moth-letes about the production of this latest piece, how it differs from their first Global Canopy film and what they’re working on next. This is your second film for the Global Canopy Programme, how has the reaction been to the first? Well, from what we understand the first film went down very well in the way the client wanted to use it, which was mainly to initiate conversations with policy makers in South America. For us, as a studio, the reaction was great and was pretty instrumental in getting us two awards in 2014 for our portfolio of work. We think people really responded to a more narrative driven approach for an environmental film. How does this film differ from the first, both in terms of style and message? The idea was to keep the style and mood of this film very similar, as almost a continuation of the ‘story’. The main difference was that this film needed to focus more on global security in water, food and energy, and less on deforestation in the Amazon. So it travels around a bit geographically and the style had to reflect that. One of the things we didn’t talk about in our last interview was the production process of the piece, can you tell us a little bit about how long the film took to make, what software/techniques you used and how you split the work between the team? Well for this second film we had a little less time, about 6 weeks production with a bunch of weeks either side for pre-production and some fine tuning. All the backgrounds were hand drawn in Photoshop, most of the character animation was done in Flash, and all the rest was done in whatever would be the fastest process (mainly After Effects!). The storyboarding and initial designs were very collaborative, we went through a few different options before settling on the look you see now. After that, Dan worked with two talented chaps, Marcus Armitage and Joe Bichard, to get the meaty bits done. Voiceover obviously plays a huge role in Planet Under Pressure – I’m assuming you were provided with the voiceover before making the film and if so how did it affect your approach to the pace, tone and style of your visuals? Working on these films has definitely educated us in some of the finer points of environmental work. For a short film, it once again tackles some meaty subjects – has working on these projects affected how you view the themes covered in the pieces? Mmm tricky question. Working on these films has definitely educated us in some of the finer points of environmental work, and it is interesting to see how GCP really try to demonstrate this inherent ‘natural capital’ of the rainforest. So instead of protecting some trees you are actually protecting your national interests on a much larger scale. In our last interview we discussed how you wanted to work more in the documentary field after your input into the feature film Maidentrip, is this still the case? Do you have any other projects we should keep an eye on in the near future? We are actually just finishing up some work for a new documentary feature film The Witness, which is looking at the murder of Kitty Genovese in 1964, an infamous case in the US. The film follows her brother, Bill, who is trying to unravel the truth about the circumstances of her death and the people who witnessed it. It is directed by James Solomon and produced by Five More Minutes Productions, and will hit the festivals in 2015. Look out for it!